A Shine of Rainbows, the film. A few years ago, Tina Pehme and Kim Roberts of Sepia Films in Vancouver, asked me if I would take a screenplay they had in development “over the finish line.” It was an adaptation of Lilian Beckwith’s beloved novel, A Shine of Rainbows. The distributor wanted the film to be geared to a family audience—so I spent the next year or so writing drafts from the point of view of a lonely young orphan, Tomas. He’s taken under the wing of the luminous Mairi, who shows him the magic in nature and the everyday world, over the objections of her practical and taciturn husband, Alec. I worked closely with the director and cinematographer, Vic Sarin, who was one of the writers of the original draft. Vic has a fabulous visual sense, and it was a pleasure to work with him to create an image structure that used the natural wonders of the Irish coast to create a kind of magic realism. Another delight was the opportunity to spend some time at the shoot in Donegal, Ireland. Aidan Quinn, who played Mairi’s husband, Alec, is a ferocious professional who had numerous questions for me that led to excellent script revisions. As did Connie Nielsen, who played Mairi. She’s a passionate actress whose commitment to the story was apparent at the first reading, where during one particularly emotional scene with the extraordinary young actor, John Bell, who played Tomas, they both started weeping. Their tears smacked on the table so loudly we had to stop to pass around the Kleenex. I’ve been to dozens and dozens of first reads and usually the actors are holding back, still trying to get a handle on their roles. Needless to say, that is one reading I will never forget. And from what I gather, Kleenex should be a sponsor of this film, because people go through a ton of tissues watching it! 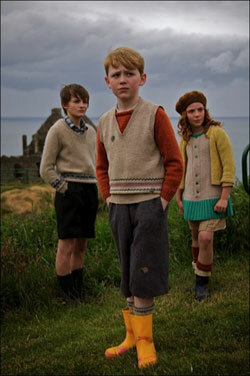 A Shine of Rainbows had its World Premiere at the Toronto Film Festival in 2009. It was subsequently picked as the Opening Gala Film at the Vancouver Film Festival. The film was an Official Selection in over 25 international film festivals and has won over ten awards, including the Leo Award for Best Screenplay. And did I mention that Donegal, Ireland is one of the most beautiful and magical places in the world? Check the IMDB production information.